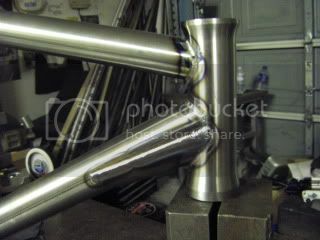 Here are the first pic's of our new TrackFighter 700c trick frame , wile the frame pictured is still technically a prototype this frame turned out exactly as we wanted straight off . I was a little worried about the BB to ground measurement but after checking the proto's against every after market 26" and 700c fork we could find, there was only .25" difference from the shortest to the tallest forks available on the market . For this reason we wont be offering this frame with a fork. 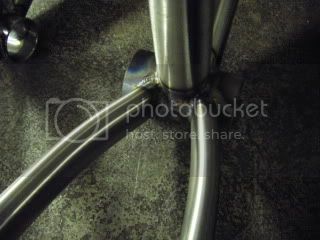 This choice has stirred up some controversy on the web forums we encourage you the end customer to use the fork you feel works best for your riding style, you wont have any trouble with this frame . In the future their might be a aftermarket fork offering from us here at Nemesis Project , I've been saying this for years now but hey Chris King finally released their BB so anything's possible right ? Please Email me! for availability and lead time on these frames . First production version will be shipped to our distributer Takashi Tuskamoto from Peakco. , so if your in Japan and don't know Takashi please Email Takashi from this link , he will make sure you get one of the first frames to hit Japan !! 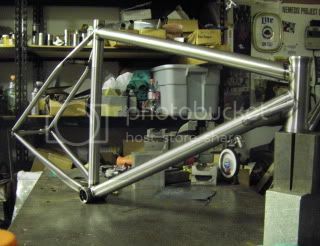 Chainstay center to center - 392.50mm fit's 35c's slammed ! 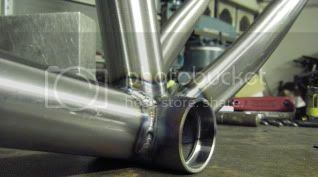 Internal 45x45 headset - proven BMX design , all our headtubes are made by SOLID bikes on their HASS CNC lathe. Spanish BB- Press fit BB bearing system design to work with 19mm and 22mm bmx cranks . No threads No fuss ! MICRO Drops - CNC machined hooded dropout , these allow us to space the chain and seatstays out further than most normal dropout designs allowing for a stiffer rear end without added material or weight. Post Weld heat-treatment - wile this is the new buzz word in all the internet forums, all Nemesis Project frames have been post weld heat treated from day 1 . Externally butted seattube W/ 7075 bonded insert- This frame features a externally butted seattube that gets slighter larger at the BB end for BB stiffness without adding weight , this new seattube also features a full bonded 7075 insert to ensure your 27.2mm seatpost can be adjusted easily without scratching . 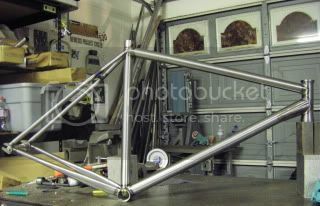 The TrackFighter frame was designed from the ground up to be a new offering in the fixed gear trick world . With GEO intended for todays of rear wheel tricks this bike is designed to sin and pick up easier then normal "GO FAST " designs . 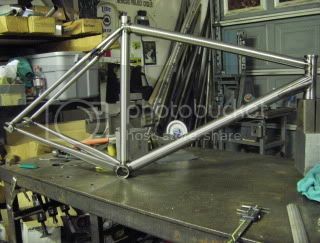 Frame construction - Built from True-Temper supertherm tube set's this frame is designed and built to last ! Handmade!- Not made by idiot's with machines , or imported from another nation ! ALL Nemesis Project frames are handbuilt by skilled craftsmen with the finest tools available today . Snap-On hand files , Miller welders , Enco and Bridgport mills all assembled on a custom made Helfritch frame fixture ensuring you the customer recived a quaility product designed to outlast even the most abusive rider. Support U.S.A. based fabrication ! !